Deepak Sharma has done BA from Delhi University. He then did a PG Diploma in Business Management from ICFAI. He started giving trainings in 2003. In 2016 he founded Deep Success Mantra Services which provides Wellness, Corporate, Skill Development & Career Services. 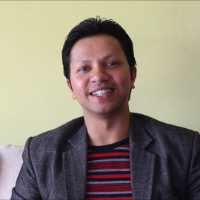 He is a Life Coach, Wellness Consultant, HR Consultant, Yoga & Meditation Master and Soft Skills Trainer. A wellness consultant is a professional who assists individuals in achieving and maintaining optimum wellness by advising them about healthy diets and exercise, as well as methods to cope with stress. "I have done BA from Delhi University. I then did a PG Diploma in Business Management from ICFAI. I started giving trainings in 2003. In 2016 I founded Deep Success Mantra Services which provides Wellness, Corporate, Skill Development & Career Services. I am a Life Coach, Wellness Consultant, HR Consultant, Yoga & Meditation Master and Soft Skills Trainer." "I have done BA from Delhi University. I then did PG Diploma in Business Management from ICFAI. I started giving trainings in 2003. In 2016, I founded Deep Success Mantra Services which provides Wellness, Corporate Training, Skill Development and Career Services. I am a Life Coach, Wellness Consultant, HR Consultant, Yoga & Meditation Master and Soft Skills Trainer." Life Coaching is a solution-focused approach to personal development that can help someone to make lasting change in all areas of their life. Coaches facilitate this change for their clients by empowering them with specific tools and scientifically tested techniques that work.